For the characteristic economics essay or book lays out-“Like a patient etherized upon a table”-an account of the economy, or some part of it, demonstrating how it works, or doesn’t work. Often the putative truths contained therein are unpleasant, like the iron law of wages in the 19th century or the natural rate of unemployment in the 20th. Nonprofessionals are frequently prompted to ask, not “What is it?” but the truly overwhelming question, “What should we do about it?” Professional economists have tended to brush that question aside. They are, they say, scientists, not humanists; and science concerns what is, not what ought to be. But there is another reason for the posture of most economists, and that is the problem posed by the first sentence of the last chapter of John Maynard Keynes‘ General Theory of Employment, Interest and Money: “The outstanding faults of the economic society in which we live are its failure to provide for full employment and its arbitrary and inequitable distribution of wealth and income.” One would have to be extraordinarily deficient in empathy for one’s fellow human beings not to recognize the justice and urgency of Keynes’ dictum. One would also have to be exceptionally ignorant of the ways of the world to imagine that the problem will simply solve itself. Indeed, anyone with empathy and knowledge must find it acutely uncomfortable to deny that confronting those “faults” is the special responsibility of economists. Yet starting with Adam Smith in 1776, the history of modem economics has instead been the story of a search for an automatic polity, a mechanism that, whether it makes all well or not, at least makes everything inexorable. With Smith, of course, it was the invisible hand. With Jeremy Bentham it was the felicific calculus, supposed to operate like Newton’s laws of motion. With Jean-Baptiste Say it was production creating its own demand. With John Stuart Mill it was supply and demand. With Karl Marx it was dialectical materialism. With William S. Jevons, Leon Walras and Carl Menger it was marginal utility. Among our contemporaries, equilibrium is the chosen control-metaphorical with John Hicks, mathematical with Gerard Debreu and Paul Samuelson, quasi-psychological with Frank Hahn and Edmund S. Phelps. All those I have named are honorable men, as I believe almost every economist to be. I am sure none would dispute the truth of Keynes’ pronouncement. Faced with the enormity of the problem, though, all, with the possible exception of Marx, have found in pseudoscience an excuse for denying the need or ability to do anything substantial, and hence for refusing their responsibility. The first thing to note about the problem is that originally it was a double pronged affair, but by now the prongs have joined together. In the ancient world, the feudal world and the mercantilist world, you could have full employment along with unconscionable disparities of wealth and income. Perhaps even in Keynes’ day, over half a century ago, it was possible to consider the two great failures of the economy separately. Today, however, we shall not be able to solve unemployment without at the same time solving maldistribution. An explanation for the intertwining of the two problems was suggested by Joseph A. Schumpeter in an observation of the sort he made so casually and so tellingly. “The capitalist achievement,” he wrote, “does not typically consist in providing more silk stockings for queens but in bringing them within the reach of factory girls in return for steadily decreasing amounts of effort.” The modem economy, unfortunately, may not be quite so good to factory girls as Schumpeter suggests. The reason lies with the opportunities the wealthy have to dispose of their income. In most cases, their money derives from mass production, but they do not spend much of it on the products of the assembly line. This is not merely a matter of taste. It would be flatly impossible to do so. You can buy a top-of-the-line Mercedes, the archetypal expensive, mass-produced commodity, for about $145,000. If you were a senior officer of a Fortune 500 corporation, or a partner in a major financial house, you could pay cash for a brand-new Mercedes the first of every month, junk it at the end of the month, and still have more money than you and your family could conveniently spend. Traditionally the wealthy have invested their surplus, a practice generally considered to return it to the producing economy it came from. And, like Prufrock’s Yankee contemporary, Miniver Cheevy, they think they “have reasons” to believe they are doing something good. Theoretically, for example, their investment would make more silk stockings available at lower prices by increasing productivity. But in common with the romantic notions Cheevy holds so dear, the idea is largely spurious. This is because, regardless of what distinguished economists say, the producing economy is, in general, overcapitalized. As things stand, it could very easily, without investment in another machine or machine tool, increase its output by 15 or 20 per cent. It has that capacity right now. More investment will not lead to greater productivity. Increased demand would. But Chairman Greenspan still hopes to restrain the “exuberance” of the stock market-in which case its upper middle class “wealth effect” will disappear. And far from trying to stimulate consumption, credit card companies can’t wait to put fear of a new bankruptcy law into their lower-middleclass clients. These actions reduce the nonwealthy to relying on what they earn by working, and what they earn necessarily falls short of being able to buy what industry produces: Schumpeter’s silk stockings (or their millennial equivalent) become less affordable. The shortfall is equal to the earnings and other withdrawals of the wealthy. Its correction must also come from that source. LEFT TO THEIR own devices, how do the wealthy spend their money? After buying several Andy Warhols and subscribing to tables at a couple of dozen charity balls, it is all too easy to become frustrated by the attempt to consume one’s income and turn to speculation. So the money the wealthy take out of mass production industry stays out, and the money devoted to speculation becomes a flood. A “moderate” session of the New York Stock Exchange today sees half again as many shares traded as were thrown on the market in the frenzy of the crash of October 1987. And still there is not enough to meet the demand. Besides the NASDAQ and the Amex and the mercantile exchanges and exchanges abroad (including way stations all over the new global village), there are $85 trillion worth of derivative “products” invented by clever bankers and brokers to facilitate betting on almost anything you can think of. In comparison, numbers running is child’s play. Also in comparison, trying to make money by operating an enterprise that turns out actual goods and services is a mug’s game. As fortunes are made in speculation, the opportunity cost of productive enterprise rises. To keep those who have invested in industry from selling out, they have to be promised increased profits; and the fashionable way of doing that is for lean and mean companies to become leaner and meaner, thereby narrowing the already narrow market. Where once there was a spreading wage-price spiral, heading upward, the economy has slipped into a constricting lean-mean spiral, heading downward. The wealthy are not the only ones contributing to this trend. The middle class is the beneficial owner, through what are called “institutions” (especially mutual funds and pension funds and insurance policies), of between one-third and one half of all the shares on the current exchanges. By being funded rather than treated as current expenses, these institutions soak up purchasing power and weaken aggregate demand. The funds’ speculating deprives the producing economy of efficient financing. The resulting shrinkage of the producing economy raises the rate of unemployment, accelerating the erosion of the middle class the institutions were created to protect, and exacerbating the polarization of society. That is how we are approaching the turn of another century: The nonwealthy are unable to buy the products their industry can produce; industry consequently has fewer opportunities for expansion; the wealthy consequently have fewer opportunities for productive investment; the nonwealthy consequently have fewer job opportunities and more of them become unemployed (“naturally”). It is easy to convince yourself that looking to the government to fix the situation is hopeless. President Franklin D. Roosevelt couldn’t get a cap on stay-at home incomes even in the midst of World War II, when millions of young men and women (and middle-aged ones, too) were risking their lives for their country. President Richard M. Nixon, despite being re-elected by the second largest percentage of the popular vote yet recorded, couldn’t enlist a Congressional majority for a negative income tax. The current tax law, whose top rate is less than half the top rate of 25 years ago, does not assess even the present top rate against capital gains. And who can imagine the Federal Reserve Board maintaining an interest rate that is either low or steady, let alone both? Some (if not all) of these things should be done to mitigate the polarization of our society. If they can’t be done in the current political climate, what can economists be expected to do about it? Well, if economists can’t suggest answers, the least they can do is get out of the way. Certainly no solution will succeed if no one has the will to work for it, and certainly those most responsible are the people claiming professional status. In the meantime, the outstanding “faults” of our economic society, albeit forged into one, are substantially identical with those of Keynes’ day. But the degradation, despair, and (in the words of the late Erik Erikson) negative identity are worse. Will human voices wake us before we drown? Ed. Well, I’ll be damned. The author, uncharacteristically, has the quote wrong. Eliot wrote of “streets”, not “songs” that follow like a tedious argument …. PRESIDENT CLINTON’S $31 billion “stimulus package” was defeated by a filibuster that was organized, not on the reasonable ground that the package was woefully inadequate, but on the fanciful ground that by increasing the deficit it would hurt the recovery now supposed to be under way. I want to talk about the alleged recovery, but first let’s pay our respects to the deficit. Suppose we had an adequate stimulus – something on the order of $200 billion, rather than the proposed $31 billion. That kind of money could knock 5 points off the official unemployment figure, bringing it down to an arguably tolerable level of 2-per cent, and could start to do a job as well on those who are working part time or are too discouraged to look for work. But could we afford it? Of course we could. The late Arthur Okun, a universally respected economist and the chairman of the President’s Council of Economic Advisors under LBJ, maintained that a 1 per cent rise in unemployment causes a 3 per cent fall in real national product. If Okun’s Law works backward and becomes a multiplier (not guaranteed), the 5 per cent fall in unemployment we’re after should result in a 15 per cent rise in output. That would be about $850 billion and should, in turn, yield about $210 billion in taxes at present rates – not to mention the gains for state and local governments, or the savings in reduced welfare outlays. So our massive stimulus could produce a modest reduction in the deficit. As Mr. Micawber would say, result happiness. The result would still be far from misery even if Okun’s Law didn’t quite work backward, and even if the government proved incompetent in all the ways the naysayers say it is. If we had to borrow the entire $200 billion, the deficit would be increased by the interest, or by $13 billion–and if the Federal Reserve Board should miraculously decide to be on the same team as the rest of us, the interest could be as low as $6 billion. Are you worried silly about the $16,750 that rabble-rousers say is your share of the national debt? Grow up. I have a $75,000 mortgage that I’ll not pay off if I live till I’m 105. The bank isn’t worried. My estate will pay it off, of course, and whoever buys the house will mortgage it again and will no doubt later refinance the mortgage to pay for some improvements or repairs. And so on. It’s a well-built house and should last (and be mortgageable) for another hundred years or more. All that’s necessary is for the successive owners to be able to pay the interest. The same is true of the United States of America and its national debt. What is the alternative? It is proposed that we get government out of the way or off business’ back or whatever metaphor appeals to you, and let the present “recovery” rip. The good old free enterprise system, we are told, the very system our economists are teaching with such smashing success to Russia and Eastern Europe, would soon show that a man knows what to do with his money a lot better than some bureaucrat in Washington. You bet. In addition, there’s an assumption that economists pretend doesn’t matter. All the buyers and all the sellers are assumed to know all about all the products available and the demand for them. Whoever believes this assumption should have followed me around last week as I shopped for a new automobile. I don’t even know how to kick the tires. A contemporary school of economists gets rid of this assumption with another, namely that everyone acts rationally and rationally expects everyone else to act rationally, too. If you accept each of the assumptions, you probably can see some sense in the notion that an invisible hand will guide us to the recovery of our dreams. Don’t be too sure. If I really knew what I was doing when I shopped for a car, I’d make the best buy possible–and so would you and everyone else. One dealer would start to get all the business. Then the competitors would lower their prices, and pretty quickly there would be one big price war. Short of collapse, there could be no end to such wars. All competitors can lower their prices by cutting their costs. Their costs are someone else’s prices, which likewise can be lowered by cutting costs. And so on ad infinitum. David Ricardo and his followers argued that this regress would be stopped by the costs of food and other basic things (called “wage goods”) that workers need to survive. But the costs of wage goods are not immune to cutting, so the regress would continue. Very likely some people would lose their jobs as prices tumbled, although the classical theory merely calls for wages to fall. Either way, if the free market were left to its own devices, the price-cutting, cost-cutting, payroll-cutting, demand-cutting sequence would continue unabated until prices, payrolls, production, and profits all approached zero. The free market could not stop the process – nor, if they played the game by the rules, could any of the participants. The invisible hand pushes everyone and everything inexorably down. So take your pick. The Walrasian theory has free competition ending in monopoly. The more conventional theory, though it says nothing about an end, offers no reason why general disaster should not result. There is, of course, a third outcome – what actually happens. For we take steps to prevent disaster, either by accident or by design, and those steps reveal that we are, by turns, do-gooders, pragmatists, and sponsors of crime. In our role as do-gooders we enact child labor laws, minimum wage laws, worker-safety laws, social welfare laws, and many other laws to mitigate the horrors of free competition. It is not bad to do good – except in the eyes of conventional economics. In his speech launching the idea of a natural rate of unemployment, Milton Friedman condemned all altruistic measures. They would, he said, increase the natural rate of unemployment. Pre-Depression America, which knew very little of such things, is touted as a time of low unemployment. It was also a time of child labor, the 12-hour work day, labor injunctions, and similar amenities. It must be confessed that we are more comfortable thinking of ourselves as pragmatists than as altruists. In any event, whereas businesspeople applaud the pronouncements of conventional economics, very few act in accordance with them. They may compete vigorously, but very few compete primarily on price, having learned (as a book of business advice once had it), “Don’t sell the steak. Sell the sizzle.” With less pressure on prices, there is less pressure on costs. Finally, we are sponsors of the crimes we deplore. A character in the funnies used to say, crime don’t pay well. For most practitioners that may be true, but it pays enough above the bottom of the current legitimate pay scale to entice hundreds of thousands into making a career of it. If these people were to renounce housebreaking and carjacking and mugging, and were to look for decent work, their competition for jobs would push the legitimate pay scale even lower. AND THAT’S not all. As John E. Schwarz and Thomas J. Volgy show in grim detail in The Forgotten Americans, there are 30 million working poor in America – people who are desperately trying to live the work ethic yet still cannot afford the basic necessities at the lowest realistic cost. Heartbreaking thousands of these people take a flier at drug running or prostitution just to survive. We are, as I say, sponsors of all this crime and squalor. It serves to retard the free fall of the economy, and with our altruistic and pragmatic practices it will eventually help us to settle at a stopping point somewhere between here and the pits. Economics, however, takes time, and it will be years before we reach that point. When we do reach it, we will find ourselves in what economists call an equilibrium, with upwards of a quarter of our productive capacity unused, with 20 million of our people unemployed or underemployed, and with probably 50 million men, women and children living lives that are far from solitary but are nevertheless (in the rest of Hobbes’ phrase) poor, nasty, brutish, and short. I don’t suppose that, aside from a few fanatics for the apocalypse, there is anyone who is eager for such an equilibrium. 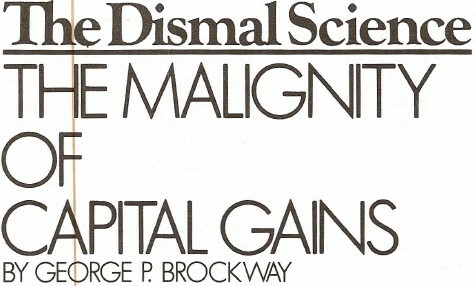 But there are many millions who are capable of denying its possibility, and (as with other diseases) the denial makes its actuality the more deadly – especially since conventional economics can think of no way to upset the equilibrium, except by doing more of the same. The thing about these equilibrium upsetters – these wars and these creative destroyers – is that they’ve all required ever bigger expenditures by ever bigger government. The expenditures for war are obvious; but often forgotten are the grants of public land to build the railroads, together with the postal contracts to keep them running, and the paving of streets and building of highways for the automobile. Is it conceivable that we can summon the wit and the will to make the expenditures that need to be made today? I cannot conceive it. What is all too probable is that the welfare of the nation and of increasing millions of our fellow citizens will continue to be sacrificed to an accounting fantasy called a balanced budget. THE RECURRING wrangle over the fairness or unfairness of capital gains taxation, while certainly not irrelevant, has distracted attention from the malign effects on the economy of the search for capital gains. We hear on the one side that they are largely the concern of the rich, and of their pursuit by rapacious business executives. On the other side we are told tales of young men enabled to realize a great invention with the help of a timely investment by some capitalist with vision. We learn, too, of family farms and family businesses, of personal art collections, and of great tracts of unspoiled wilderness that would not be put to their best social uses if equitably taxed. We hear all of these things, and most of them are true, or could be true. But we hear little or nothing about the influence of the search for capital gains on the stock market and, through the stock market, on the efforts of the Federal Reserve Board to stimulate the economy. It is a source of much puzzlement that the Reserve’s well publicized three-year long assault on short-term interest rates has done, if anything, the opposite of what it was intended to do. Since the summer of 1989 the Reserve has cut short term interest rates more than 20 times. The expectation, of course, has been that lower rates would encourage producers to borrow and invest in plant expansion and modernization. The resulting increased employment, coupled with lower rates on consumers’ loans, would encourage consumers to buy, thus validating the producers’ expansions and setting the economy on a sustainable upward curve. The plan made sense from almost every economic point of view, yet its failure is manifest. Producers are shutting down plants instead of opening new ones; unemployment has risen painfully; corporate profits and personal savings are both down; retail sales continue to be disappointing. For most of the economy 1991 was a bad year, and 1992 is worse. But one sector flourished, and continues to flourish. Nearly all brokerage houses are prosperous, some of them more so than ever before. The stock exchanges, despite waffling between their January and July peaks, have been buying and selling at a record rate. It has been a long time since Wall Street was primarily concerned about the business prospects of the firms whose shares the exchanges trade in the hundreds of millions every business day. Two statistics dominate the thinking of speculators. The first is unemployment, which is a worry because there is supposed to be a trade-off between unemployment and inflation. But in only three of the 46 years since the end of World War II has unemployment been higher than it is today; so regardless of the validity of the supposition, there is little fear of an imminent resurgence of inflation. The other number that concerns Wall Street is the interest rate, because the capitalized value of any income-earning asset goes up as the interest rate goes down. The reaction of the secondary market for short- term bonds and notes is almost automatic. The long bond market, being congenitally fearful of inflation, follows at a more circumspect pace. As the prices of bonds rise, common stocks become more attractive investments, both for income and for capital gains. Therefore, as the Federal Reserve Board has lowered the interest rate, the stock market has climbed. Investors especially speculators eager for capital gains-have rushed to take advantage of the quick profits. Money has poured into the stock market. Now, that money obviously had to come from somewhere, and its ultimate source had to be the producing economy, where things are made and sold and services are performed and paid for. It may be old money from CDs and money market funds and bonds, or it may be new money borrowed at the new interest rates. In either case, it is money that the rising stock market denies to the producing economy. The lower interest rates, instead of stimulating the producing economy, have caused money to be drained away from it. Hence the deplored credit crunch. Unfortunately, there is nothing the Federal Reserve Board can do about this. A continuation of the policy of lowering the interest rate will lead to a continuation of its consequences. A determination to stand pat will leave us in our present doldrums. A reversal of policy, raising the interest rate, will not only deepen the recession but very likely cause the market to crash. Moreover, when the market crashes the money that is lost simply disappears. It is not returned to the producing economy, nor does it reappear as cash in someone’s pocket. Gross private domestic investment, as a percentage of GNP, was practically unchanged in 1986, 1987, and 1988 (the year before the crash, the year of the crash and the year after the crash). The percentages were 13.5, 13.1, and 13.8, respectively. As for cash, M1, which includes it, fell in 1987 as the market fell. The lost money was gone forever. Was the Reserve wrong, then, to reduce the interest rate? Certainly not. Usurious rates are largely responsible for the recession, and still lower rates will be necessary to end it. It is true that the discount rate is now lower than it has been for 30 years. It is also true that it is three times what it was in 1947 and six times what it was on special advances in 1946. Although the Reserve Board’s recent intentions bay be good, they have been, and will continue to be, overwhelmed by the altogether understandable rapacity of seekers after capital gains. It’s easy to make money on a rising market, but you have to risk a dollar to make a dollar. The dollars that you risk are dollars you might have risked in buying a new machine for your factory or in replenishing the inventory of your store. Your broker will try to tell you that by buying a share of stock you are producing goods just as much as if you were buying a machine for your factory. But of course the stock and the machine don’t both produce goods and it takes time to make money with the machine, while you can do that on the stock exchange very fast. So if you’re smart, you will play the market, and the Federal Reserve Board will be frustrated. If the Federal Reserve cannot get us out of this mess we are in who can? Unwittingly, President Bush has pointed the way – even though, characteristically, he was looking in the other direction. He has proposed a low capital gains tax, and a still lower tax on gains on some assets held more than five years. It won’t take you very long to see that his proposal would merely make more attractive the speculation that drains money from the producing economy. Yet a sliding tax scale could take the profit out of speculating. If I had my druthers, I would have a capital gains tax that went something like this: Gains on some assets held more than five years would be taxed at 95 per cent, gains on assets held more than a year but less than two years would be taxed at 90 per cent, and so on, with the rate falling 5 points a year for 10 years. Some changes in the tax law should be made regardless of the rates. Gains certainly should be taxed when assets change hands by gift or bequest as well as by sale. Capital gains of otherwise tax-exempt institutions should be taxed, because such institutions are responsible for much of the current market churning. On the other hand, it would be desirable to exempt principal family residences that fall below a certain value, along with small family farms and businesses. Capital gains are an archaic form of profit. Despite their name, they are typical not of the capitalist system, but of mercantilism and more primitive economic systems. Likewise, the speculation that gives rise to them is an archaic form of economic enterprise. In the Renaissance the merchants of Venice organized each commercial voyage as a separate affair. Their personal experience taught them the sorts of goods most likely to be wanted on the Golden Horn. They stocked their outward bound galleys accordingly, and they brought home the sorts of things they could sell quickly and profitably at the quayside. The system was a series of speculative ventures, making the most of ad hoc opportunities to buy cheap and sell dear. When the selling was ended, the enterprise was ended, too. Capital gains are realized only when an investment is withdrawn and ceases. Four years ago it was argued (fallaciously) by candidate George Bush that reducing the capital gains tax would increase tax collections (see “George Bush’s New Trojan Horse,” NL, September 19, 1988). His lips seem to be buttoned shut on that one today. Now we are told that reducing the tax would stimulate business, a notion dear to the far Right, which nevertheless mysteriously mistrusts him. But surely the Federal Reserve Board has had enough experience in the past three years to prove that to encourage capital gains is to encourage speculation, and that to encourage speculation is to induce a credit crunch that throttles productive enterprise. A low capital gains tax is unfair because it is for the principal benefit of the rich. It is also economically counterproductive. WE ARE SUPPOSED to cheer the Bush Administration’s clean air bill, which is intended to cut sulfur dioxide emissions in half by the year 2000 and to do various other things. Well, I do cheer. Anything at all is better than what we’ve had for the past decade. But there is a catch here-as there seems to be to every kinder, gentler proposal. 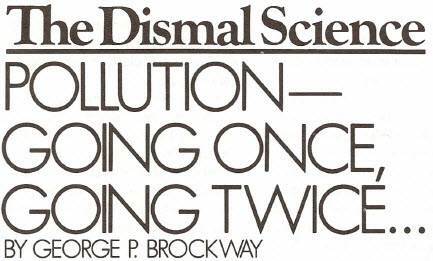 Pollution control is going to be turned over to the economists, led by Michael J. Boskin, chairman of the Council of Economic Advisors; and the economists are going to push for as silly an idea as any the profession has spawned in this century. Unfortunately, this idea of theirs is not simply silly; it is, in a word, uncivilized. They should be ashamed. The scheme is to establish a market for licenses to pollute-or, as I have sometimes heard it delicately put, for effluent rights. This scam has been around for several years (you might even have read about it in this space as early as December 28, 1981). The major premise is that enforcing antipollution laws is expensive. The minor premise is that the free market can do everything. The conclusion is that rights to pollute should be auctioned off to the highest bidder (an auction being erroneously viewed as the ideal market), then the government could use the money to clean up the messes the polluters bought the rights to make. Not only that, but the rights could be transferable- sort of like taxi medallions and the hope is that they would be traded on one of the exchanges, even that a futures market could be developed. And not only that, but environmental groups could bid for the rights and thus render them more expensive for polluters. If it weren’t a restraint on trade, environmental groups might go ahead and buy some of the rights and keep them off the market, thereby actually stopping the corresponding pollution. The mind boggles. Anyone who has had the slightest connection with government can foresee dozens of practical difficulties with the scheme, especially if local governments are involved. I’ll take up a couple of them later. For the moment, let’s look warily at the theory. Yet antitrust laws are so difficult to write and so expensive to enforce that Milton Friedman, our contemporary conservative guru, throws the whole thing over. We act as if we had perfect competition, he says; therefore we do. On the same reasoning, we act as if pollution weren’t worth taking much trouble about; therefore it isn’t. Once you start thinking this way, there is not much left for government to do; and if the voters get excited about pollution or whatever, you can pacify them by holding an auction. It would seem, for example, that the current fuss over the best way to approach the drug crisis is misdirected. It would be more economical to auction off the right to sell crack on the streets, possibly restricting the bidding for certain prestigious posts (like Official Lafayette Park Purveyor of Props for Presidential TV Shows) to pushers who promise to shave and wear a jacket and tie, even in summer. Closer to pollution rights would be adulteration rights. The Pure Food and Drug Laws are expensive and difficult to enforce, too, and require lots of enterprise- stultifying paperwork. Why not auction off adulteration rights? We might have separate auctions for the right to mix sawdust with flour, for the right to let a processing plant get a teeny bit filthy, and for the right to use handy carcinogens without telling anybody, and without being sued if found out. This last auction would have to be carefully handled to avoid adverse publicity for the winners, which might have a depressing effect on their sales, and hence on the GNP. To be sure, carcinogens are life-threatening. But so are air and water pollution. And so, for a different sort of example, is jogging in New York’s Central Park at night. As I suggested here eight years ago, why not admit that taxes would have to go up if Central Park were made safe? The economical solution would be to auction off mugging rights. Wilding rights might go for a little less per participant because of economies of scale. Also, we’ll be better able to compete internationally if we teach these youngsters how the free-market system works-or anyway how economists think it works. On the other hand, the knock-down price (no pun intended, of course) for the right to commit mayhem and murder might be a bit higher. One would not want to set the price too high, because there wouldn’t be any bidders, and there would be no money to pay for the homicide squads needed to catch cheaters who didn’t pay for the rights. Some of these costs, though, could be defrayed if cops wore little logos advertising their shoes and underwear, like tennis professionals. All kidding aside, it is clear that the economists’ scheme is self-contradictory. It promises to get rid of bureaucratic interference with the free-market system. Visions of balanced budgets dance before the professors’ eyes, and of the fantastic growth in “productivity” that would result from not wasting time and money on nonessentials (“externalities,” economists call them) like clean air or pure water. Yet these visions cannot be realized unless the Environmental Protection Agency, or some surrogate, stands ready to lower the boom on polluters who refuse to play by the new rules. No one is going to pay to avoid what does not exist. AS I MENTIONED earlier, there are some practical difficulties, particularly if, instead of nationwide auctions, local options are recognized. (After all, who knows the environment better than those who live in it?) Suppose you have a steel mill on the shores of Lake Superior and you want to pollute the lake. Fine. We’ll have an auction. What are we offered? Since no one else needs the rights, how about a dollar? I’m not forgetting the busybody (and probably elitist) environmental groups. They’re spread pretty thin, however (an awful lot of their budgets goes to sending me junk mail), and can’t all enter every auction. They take turns. The steel mill, meanwhile, provides most of the employment for our Lake Superior town, and the mill’s conglomerate owner threatens to shut it down. So the town enters the bidding, swamps the environmentalists, and wins, whereupon it gives the pollution rights to the steel mill for free. Everyone is happy, except for the environmentalists and the fish and the people who drink lake water instead of beer. In most towns or regions there may be more than one polluter seeking the rights, and naturally they will compete vigorously for them. It’s the American way. Once upon a time I lived in New Jersey, where there are God knows how many separate municipalities, and almost all of them hire scavenger services. In each county there are several competing scavengers. At any rate, they all submit bids for every municipality’s business. Much to everyone’s surprise, the same fellow is low man in the same towns year after year, while other players always win in their usual towns. (Economists think they know about this, too. The scavengers’ “experience” enables them to avoid the “Winner’s Curse,” which is the result of bidding too low.) Occasionally a feud breaks out, and a few truly surprised towns find themselves opening sealed envelopes containing very low bids. The feuds don’t last long. It doesn’t take much imagination to visualize something similar with pollution rights, especially since the oil industry (one of the most stylish polluters) is familiar with a practice that looks to suspicious souls like collusive bidding. Offshore oil leases are expensive and risky, moreover, prompting oil companies to form syndicates to spread the risk. Syndicates would also appear to narrow the bidding. What I’m afraid it all comes down to is that today’s economists don’t understand government. They don’t believe in government. Although they would quickly and nervously deny it, they are like Karl Marx in thinking that the state should wither away because all questions are economic questions. They get irritated when people object to cheap imports that take away their livelihood, or when unions strike to prevent wage cuts, or when attempts are made to use taxes to distribute income a little more equitably. It further has to be said that economists do not take the general welfare seriously. They certainly don’t take the environment seriously. They don’t really believe in the greenhouse effect, or acid rain, or the consequences of PCBs in drinking water, or the possibility of another, closer Chernobyl. They can’t possibly understand these matters and make their fatuous proposals about auctioning off the right to pollute. DEAN ACHESON once remarked wearily that if anyone, at any time, found him agreeing with any Indian on any subject whatever, that person should have him certified immediately. His judgment was no doubt colored by his experiences with V.K. Krishna Menon, who wanted all North Korean POWs shipped home whether they wished to go or not. 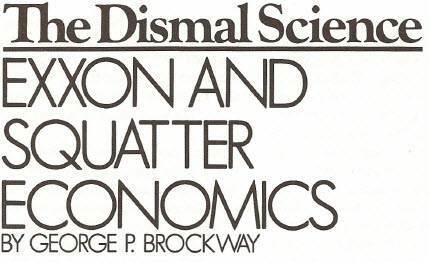 My feelings about standard economics are similar, perhaps because one summer, in a youthful fit of self-improvement, I spent many hours reading Frank Taussig’s introductory textbook when I could have been sleeping in the sun. My recollection is that Taussig, who was a big man in his day, started off by talking about Robinson Crusoe. I have since come to doubt that Robinson had anything to do with economics at all. So far as I know or Professor Taussig said, he never bought or sold anything, or used money. One by one the classic laws have lost their savor for me. David Ricardo‘s Law of Comparative Advantage was an early loser, and I wrote three columns about it six or so years ago. The notion that producers are profit maximizers and consumers are utility maximizers attracted my attention last year, and the Law of Diminishing Returns a couple of months ago. I’ve even dropped a hint or two concerning the Law of Supply and Demand, and might supply a column about it, if I detected any demand. I’m ashamed to say that in one of my early columns I made a slip and endorsed the proposition that free competition in a free market makes for the most efficient allocation of scarce resources. As Abraham Lincoln replied when requested to apologize for saying that Simon Cameron would not steal a red-hot stove, I now take that back. The issue is in the news because of the great Valdez oil spill. Some excitable people want to punish Exxon, but they have been patiently told it would be inefficient to do so. Encouraged by the sound of their own voices, the naysayers add that it would be inefficient to impose further restrictions on the exploitation of Alaskan oil, and also that an increase in the gasoline tax would distort the allocation of resources. They urge, too, a relaxation of the already relaxed standards of gasoline efficiency (that word again) for new automobiles. Red-blooded Americans, if given their druthers, would prefer very big cars that can go very fast; therefore they should be allowed to put their money where their preference is, and the speed laws should be lifted while we’re at it. The more beguiling advocates of free market theory admit that sooner or later oil will run out. They are confident, however, that the spur of possible profits will drive some mad scientist to invent a way of using crab grass or zucchini for fuel (as some tried to use dandelions for rubber in World War II), thus rehabilitating suburban agriculture and saving the automobile. In the meantime, they argue, as oil gets scarcer and the price rises higher, those willing to give up coarser pleasures are entitled to enjoy the daintier pleasure of burning gasoline in fast cars, fast boats and fast snowmobiles. Their willingness shows that is the efficient thing to do. Let’s examine the proposition, not from the point of view of ecology or even of national security (where it’s a clear loser), but from the point of view of logic. Is economics really about the allocation of resources at all? To answer that question, we have to be able to say what a resource is. How about this: A resource is something that is useful or necessary to make something else, a component of an economic commodity. So resources are things, objects. Natural resources are things untouched by human hands, lying around ready to be picked up or dug up or fished up, and used. Economic resources are also scarce. There is no point in talking about them if they are not scarce. Taussig (if my memory serves after all these years) gave air as an example of a noneconomic resource, the reasons being that there was a lot of it, and that no one could figure out how to bottle it and sell it. We’ve made progress, however. If you’re in the hospital and they decide to pep you up with oxygen, you’ll find $100 a day added to your bill. And Los Angeles knows that breatheable air would be impossibly expensive. But of course not all scarce natural objects, even those that could be readily packaged, such as bluebird nests, are natural resources. Leon Walras, the patron saint of marginal utility analysis, credits his father Auguste with the notion that an economic good has to be useful as well as scarce. This does not seem a remarkably difficult advance in thought. It does not really advance us very far, either. Maybe you are not clever enough to think up uses for bluebird nests, and maybe no one is; that does not mean a use will never be discovered or invented. Think of petroleum. If you had asked Adam Smith about it, he would have shrugged his Scotch shoulders. It was a sticky, stinky substance where it appeared, as in the notorious fields near Cumae, rendering useless the land that harbored it. Or you might have asked Karl Marx about uranium. He would never have heard of it, for one thing. What kind of resource is something you never heard of. On the other hand, ancient man mined and traded obsidian, which, apart from the art and tools the ancients made of it, is now of no interest to a Harvard Business School graduate. ONE WAY or another, then, we come to the conclusion that it is not so easy to say what economic resources are. They are useful, yes, but neither petroleum nor uranium nor a bluebird nest is, in and of itself, useful. Indeed, if you don’t know how to use them petroleum is nasty and uranium is dangerous. But our economy does know how to use them, up to a point. So they are resources for us. They are resources for us because of the way our economy is organized. The organization of our economy is, as the marginal analysts say, a price system. (Like Oscar Wilde’s cynic, we economists know the price of everything and the value of nothing.) Every price is dependent on every other price in a delicately beautiful equilibrium. It is this balanced price system that allocates resources. If tomorrow morning some bright fellow comes up with a use for bluebird nests, the supply of and demand for them (the story goes) will set the price for them. Not only that, but as the demand for bluebird nests develops, the demand for some other things must decline. But other resources (including, sad to say, human resources) are shifted into the bluebird nest industry, restoring the equilibrium. Everything is properly allocated again. Bluebird nests are now a resource, not simply because they are rare and a use has been found for them, but because they fit into the price system. That is crucial. The market does not so much allocate resources as tell us what resources are. What, then, becomes of efficiency? It disappears. It is not separately discoverable, for resources are resources because the market says so, and their allocation is efficient only because the market says so. The market is not a better way of allocating resources; it is the only way. This is what the theory says. Having said this much, it has uttered nonsense. If you really want to learn about resources and their allocation, you should go, not to Wall Street, but to someplace like World Watch Institute, which publishes an annual report called State of the World that explains the consequences of what we are doing and tells how we could do better. Nonsense is always dangerous. The horror story that “The Market Knows” damages the ecosystem. It also destroys economics itself, reducing the whole exercise to a defense of the status quo. True believers in the market apparently do not understand this, for they are very liberal (if you know what I mean) with advice about the sorts of issues we mentioned earlier – finding a way to make Exxon pay, restricting further exploitation of Alaskan oil, and so on. Yet these matters, as they now stand, are part of the present system. Changes in favor of the oil industry are no less an interference with the market than are changes in favor of the world and them that dwell therein. Once any sort of change is admissible, every sort can be argued up or down. In the 1850s, Stephen A. Douglas proposed squatter sovereignty (allowing the territories to vote on slavery), which appeared to be impartial but actually favored the South. In their renowned debates, Lincoln forced Douglas to admit that slavery could be voted down as well as up. That won Douglas the Senate seat, but cost him the Presidency two years later. It would be lovely if we could come to understand the vacuity of squatter economics. Readers should see the upcoming link about “stealing a red-hot stove.” The author attributes the quote to Lincoln but it was, according to Wikipedia, Thaddeus Stevens talking TO Lincoln. ETHICS IS suddenly a big topic. This is the doing of Ivan Boesky, Bess Meyerson, Jim and Tammy Bakker, and an obscure Marine lieutenant colonel, whose name I don’t recall. Those cynics who consider Lucifer/Satan the hero of Paradise Lost will not be surprised, nor will those realists who observe that the remembered hero of Watergate is not John G. Sirica but G. Gordon Liddy. In all the current talk, business ethics has come in for special attention, and many an editorial has proposed required ethics courses in business schools. Lester C. Thurow, the new dean of MIT’s Sloan School of Management, resists the idea on the ground that the blight, if any, goes much too deep to be reached by a tacked-on series of lectures or bull sessions. Morals, he says, should have been learned at home and in the community long before graduate school. I resist the special course idea, too, but on the ground that if students have been learning bad ethics or no ethics, it is because they have been taught bad economics. Economics used to be called an ethical science, an expression that resonates oddly in our ears. Come to think of it, our term, “social science,” gives off similar vibrations. Social relations surely have an ethical aspect (if it exists at all), while the propositions of the natural sciences (what we think of as proper science) do not. There is nothing moral or immoral about the solar system, or about the way electrons bond, or even about AIDS. Morals may be – most often certainly are – involved in the transmission of AIDS, but the physiology of the disease is neither right nor wrong. Indeed, it is only because the disease is a natural phenomenon that there is any hope of containing or curing it. Even the calls for sexual abstinence must depend on the fact that the disease obeys natural laws and is neither a random accident nor a supernatural visitation. “Nature to be controlled,” as Francis Bacon said, “must be obeyed.” Thus disease control (which is a human end) uses medicines (which are natural means). Thus engineers use the principles of physics to achieve their ends. The ends are not natural, but the means are. It is frequently argued that economics presents a parallel situation. In 1874, Leon Walras, in his Elements of Pure Economics, distinguished at considerable length between economics as an ethical science, which considered what ought to be done; economics as an art, which taught how to do it; and economics as pure science, which described how it worked. Toward the close of the century, a similar tripartite analysis was made by John Neville Keynes (John Maynard’s father). In our day, Milton Friedman, perhaps indulging a puckish humor, has quoted favorably from the senior Keynes’ work. Without those traders making their demands and offers, there is no economics, pure or applied. With those traders, economics becomes inextricably immersed in questions of morals. I do not mean merely that trade is impossible unless traders abjure fraud (at least up to a point), although certainly this is true. What I mean is that demands and offers – the fundamental elements of “pure” economics – are not acts of God or events of nature but acts of human beings who necessarily define themselves by what they do, including what they do in the marketplace. Perhaps more to the point: Demands and offers can be understood only as acts of will. There has been no lack of attempts to develop other explanations, and they form the division of economics known as “value theory.” Prices are determined by the reconciliation of demands and offers, and demands and offers are said to be determined by values. There are three leading explanations of value. The first, found prominently in Adam Smith and Karl Marx, holds that things become valuable commodities in accordance with the amount of labor that goes into their production. The second, advanced by Jeremy Bentham, argues that only useful things are valuable, and that utility derives from the promotion of pleasure or the avoidance of pain. The third, credited by Leon Walras to his father Auguste, founds value on rareté, a combination of scarcity and utility. All these explanations turn out to have exceptions. The labor theory cannot explain why a house in the Houston suburbs that sold for a quarter of a million dollars only yesterday can be bought for half that price today and will sell for a different price tomorrow. The utility theory cannot explain why proprietary drugs are more expensive than their generic equivalents. The simple scarcity theory cannot explain why gem-quality diamonds are more expensive than bluebird nests. Put them all together in the rareté theory, and you still can’t explain why baseball stars are paid in the millions of dollars and croquet experts have to pay to enter tournaments. Of course, the problem of the exceptions has not gone unnoticed. The typical solution turns on a relaxed definition of utility. Proprietary drugs, for example, may be said to be more useful to some people because they carry an implicit guarantee of quality and so enhance satisfaction and pleasure or suppress apprehension and pain. The greater perceived utility naturally results in a higher price. But see what has happened. The utility theory, like all the theories, was introduced to provide an objective foundation to value. Bentham intended his “felicific calculus” to be the equivalent of Newton’s laws of motion. In reality, though, it is highly subjective. Some people are pleased by drugs’ brand names and some are pained by the higher prices. Bentham himself summed up the situation in an aphorism: “Quantity of pleasure being equal, pushpin is as good as poetry.” One man’s pleasure is another man’s pain. Utility is what each individual says it is; it has none of the universality of gravity. IRONICALL Y, the consequence was noted by William Stanley Jevons, a leader in developing Bentham’s utilitarianism into the modern quasi mathematical theory of marginal utility. Calling for increased efforts to collect economic statistics, he wrote, “The price of a commodity is the only test we have of the utility of the commodity to the purchaser …. ” And, he might have added, of its utility to the seller, too. Price may be explained by utility, but all we know of utility is price. The other value theories are no less circular. Marx, recognizing that a lot of labor can go into producing positively harmful commodities, avers that “socially useful” labor makes value. So it is not labor that is the test of value; it is value that is the test of labor. The tree is known by his fruit. Walras’ rareté also leans on the weak reed of utility, as well as on scarcity. The only way to keep a circular argument from chasing its tail is not to let the chase get started. Let us, therefore, return to the men and women who did the price-paying of Jevons, the offering and demanding of Walras, and the laboring and social evaluating of Marx. Who are these essential people? As Pogo might say, we have met them, and they are us. The various value theories we have mentioned each try to make us into passive agents controlled by the economic counterpart of nature. Even perfect competition (the state imagined to provide perfect liberty) requires everyone to be what is called a “price taker.” Prices are then said to be made by the market. Those who quarrel with the idea of perfect competition tend to do so on the ground that competition never is and never has been perfect. That is true enough, but the reason for this is that the notion of an impersonal market that sets prices is a pathetic fallacy. Farmers are the standard textbook examples of price takers, unable to influence the price of what they sell, whether they produce more or less, and whether they sell now, or later, or never. Yet if all producers and all consumers – that is, all human beings – are price takers, where do prices come from? Only cynics claim that the individual voter is insignificant because he or she is merely one among tens of millions. The republic will not collapse if I fail to vote; it will collapse if no one votes. It is the same with economic agents. Someone has to set a price, or there is no price system and no economics. An economy of passive agents is a contradiction in terms. Economics is one of the modes of ethics. Pure economics – economics without people and hence without ethics – is a myth. Morality can’t somehow be tacked onto economic affairs, which otherwise are amoral. Ethics is there at the beginning, or it is not there at all. It is always there because there is no economics that does not concern human acts, and all human acts are acts of will. What is true of economics, the theory of business enterprise, is obviously true of business itself. Business ethics is not merely the proposition that honesty is the best policy. The ethical question, in business and everywhere, is, What sort of person am I? There is no escaping it. That question is posed by everything I do.